15" 5.5kw High-Flow Heater, 3.25 x 7.25" Digital Topside Display/Keypad (or optional 2.5 x 5.5 Topside Display/Keypad if you request this). Rated for 230 volts 4-wire incoming power or 115 volts, it is changeable. 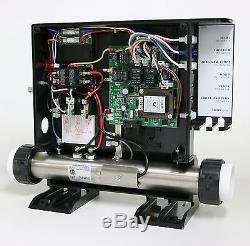 From Spa Pumps And More. This Smartouch Digital Control comes with 15 hi-flow heater, Topside display/keypad, power cords, and is a complete unit to replace your old spa control and heater. 3.25 x 7.25" topside drops into 2.2x6.2" cutout in your spa, see 2nd photo. The smaller one is 2.5x5.5" and drops into a 1.7x4.7" cutout hole. For 4-wire 240 volts or 3-wire 115 volts sources only. The listed unit is not for 3-wire 230v; please message if you need 3-wire 230. 3-wire is less common and is built to order, takes an extra days time, just message us if you want 3-wire, please. 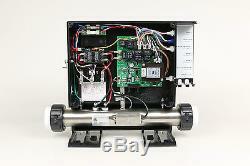 More info at Spa Pumps And More. A power source from the house that is 4-wire has a true neutral, a ground, and 2 hots. 4-wire may be branched to provide 230v to devices as well as provide 115v to other devices, via the Neutral wire. A European style 3-wire power source has no neutral, and only a ground wire and 2 hot wires, and can not provide 115 volts to any device therefore 3-wire systems are limited to being all 230 volts. This is a high flow system for 1-1/2" or 2" pvc pipe size plumbing systems and requires a minimum flow of 20 GPM , it is NOT for low flow systems with 3/4" or 1" plumbing. This high flow heater can NOT be modified to work on low flow plumbing. Runs a main 2 speed spa pump, and an air blower (or 2nd single speed pump), and spa light, and has an output for ozonator or ionizer or any other non-switched device. Comes with a new power cord for your main 2-speed pump, with quick disconnect plug to the control. You also get quick disconnect plugs and short'pigtail' cords for the air blower, spa light, and one accessory device, like an ozonator. These are short cords meant to splice to your existing light cord, blower cord, and ozonator cord, using wire nuts. Includes 15 inch long x 2.25 diameter 5500 watt stainless steel high flow heater, can be used on 115v or 230 volts, it's changeable voltage-wise. This is the common length of heater for 98% of hot tubs out there, comes with industry-standard black plastic split nuts with common buttress threads, so can couple right up to your existing plumbing if you have a 15 heater now. The Smartouch SMTD 1000 can run off your 4-wire 230 volt supply voltage or off of a 3-wire 115 volt household power. Also, the pump and blower voltages can be changed to either 115v or 230v. 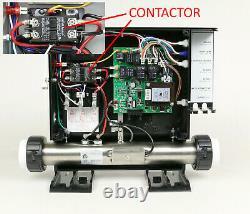 On a 115 volt source, the heater will be 1.4kw or 1375 watts. From the factory the SMTD1000 is set for 230v incoming power, 230v to the heater, and 115v to the pump, air blower (or second 1-speed pump), and the ozonator, and 12 volts to the light, which is industry-standard. Or, you can change the voltages yourself, it is easy. Can be mounted in any direction or position, even upside down, and the water can flow either direction through the heater. Can be fitted to 1-1/2" or 2" PVC pipe size systems. Intended to be mounted under the redwood skirt of a portable spa, not out in the rain, please note. User's Manual shows how to program changes into the control, but it is factory programmed, and tested by ACC, and ready to go as is. Control box stands 14.6" tall, and 15.4" wide, 5" deep, heater is 15" flange to flange. Designed, built and tested in the U. By ACC, a rugged, proven, spa control, good tech support, good parts availability, made in California. Not refurbished, rebuilt, demo, all is brand new in factory packaging, warranted and backed by Applied Computer Controls. ACC has been building digital hot tub controls over 30 years. 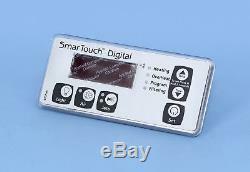 Smartouch Digital Control by ACC model SMTD1000. 15 stainless steel flow-through heater with standard threaded couplings. Digital display keypad (topside) 3.25x7.25" with 57" long cable. Extension cords available at extra cost, message us please. Pump 4 wire power cord with quick disconnect AMP plug and motor connectors. 4-wire is Neutral, Ground, L1, L2. Air Blower pigtail with quick disconnect AMP plug, 18/3 wire size, to splice to existing blower cord. Ozonator 7 pigtail with quick disconnect AMP plug, 18 gauge wire. Light 7 pigtail with quick disconnect AMP plug, 18 ga wire. ACC User's Manual (can be viewed on the ACC-spas website if you care to). Warranties: all warranties are from the manufacturers who made the goods, not from the distributors, dealers, or resellers. Heater warranties do not cover running with air in the system (dry-fire) and burning a heating element, as this is not a defect. Pump warranties do not protect against seals being scratched by debris and leaking. Standard stuff, but just fyi, so you are aware. 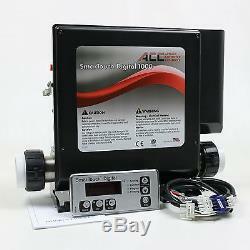 PROGRAMMING GUIDE and Wiring Diagrams can also be viewed on the ACC-spas website if you are interested. So message us if you want 3-wire and we'll respond with cost and leadtime. The item "Spa Control Hot Tub Heater Digital Controller Pack L SMTD1000 ACC 5.5kw 115/230" is in sale since Sunday, September 30, 2018. This item is in the category "Home & Garden\Yard, Garden & Outdoor Living\Pools & Spas\Spas & Hot Tubs". The seller is "spapumpsandmore" and is located in Los Angeles, California.